BACKTOFRANKBLACK.COM: Millennium Limited Edition CD still showing stock! Millennium Limited Edition CD still showing stock! Merchandise news: The Limited Edition Millennium CD came out last month with a print run of only 2000 units. While not directly linked to the campaign to return Frank Black, the more money made by Millennium products adds to the franchise's commercial worth! 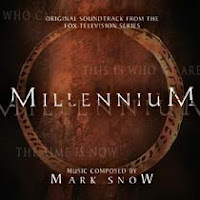 More importantly, it's a great piece of merchandise for any fan of Millennium or Mark Snow with a comprehensive booklet and two CDs worth of Millennium. The store is still showing copies at La La Land Records, so maybe treat yourself to this rare opportunity to buy some new Millennium material! More campaign news upcoming later today! Watch this space! 0 Responses to "Millennium Limited Edition CD still showing stock!"